What do scallions have to do with my topic? Nothing. But I just did them, and wanted to show them off! My new wakeup time is 5am; I’m three weeks in. I used to get up mostly-6:30 am, or occasionally 7:30, but I felt like I was missing some prime hours for writing, especially. Even though at first I had stationary jet-lag, now that I’m acclimated, I really look forward to mornings. Quiet time with just pencils and keyboard, preferably stretching into 11am or so. Seeing the sun rise while really cooking on a story, makes me know I have “right work”: writing and illustrating and telling stories is what I want to do for the rest of my life. It is so satisfying to nurse an idea into a story, and then to show it to a kid and see a light go off in that amazing young brain. Who knew I even LIKED kids?! I do this much more for ME, to be honest. But if I can have a hand in getting a kid curious about something, that is a massive bonus. Here's my 2017 Christmas card, with thanks to Kunio Isa for the color palette and texture inspiration. And I stole his moon! Several years ago, I was looking through a box of old letters with my mom. I discovered a greeting card she had kept from a friend I'd never heard of before with this gorgeous print (below) by an artist named Kunio Isa. It's called "Akamagaseki at Night". I loved the simple palette of 3 shades of blue on white and the spare composition that had such a great sense of depth without any shading or atmospheric perspective. Much as I loved it Mr. Isa's composition, I didn't feel like copying it, like I had done with Searle and Blake (earlier posts). Too many little windows! Also, I doubted I'd be able to capture the feel of a print without actually making a print. Plus, it didn't have any polar bears in it! * But I liked working with such a limited palette, and I was even inspired to make my own Japanesque "chop" (signature seal), though I cheated by making it with colored pencil instead of carving a block of soapstone. I was able to capture some of the sense of the print texture in my own piece by painting washes of watercolor on Arches cold press paper and scanning it into Photoshop, creating the background for my bears (also painted on cold press). 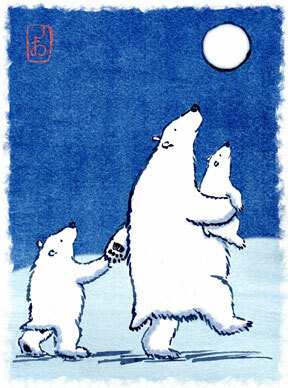 My bears came out much more saturated than Isa's piece, but I'm still happy with it. *I wanted to come up with something for a Spoonflower fabric pattern challenge: to create a design with "Arctic Animals". Here's Kunio Isa's gorgeous "Akamagaseki at Night". I think I first saw Ronald's Searle's work on the cover of Fear and Loathing in Las Vegas by Hunter Thompson. I just love this world-weary cat! Searle's drink of choice was champagne, apparently even while working (or maybe especially while working? ), but even so, an amazingly prolific artist. He has a gorgeous facility with ink lines - some thick and jittery, others delicate and graceful, combined with those expressive spatters. I also appreciate his subtle use of color. He often colored only a single object in an otherwise black and white image. 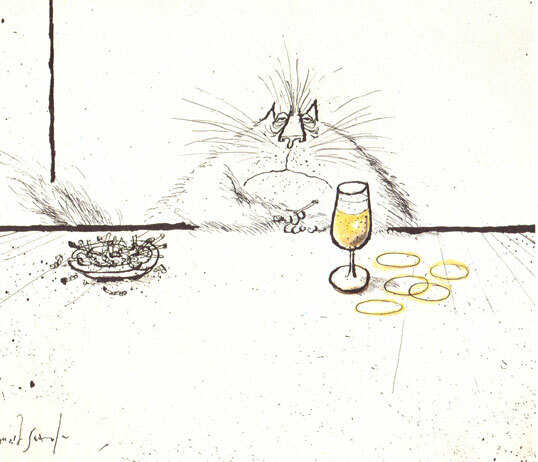 Here's the original Searle, below. I didn't fully capture his frenetic, jiggity-jaggedy lines, but attempting to was an education. This is my ink and watercolor copy of a charming little illustration by Quentin Blake. I painted this after watching Lee White's "How to Discover Your Style" video on svslearn (I highly recommend both that video and the SVS Learn illustration tutorials in general). Following Lee's suggestion, I picked 20 images by illustrators I admire. I'm planning to do several copies of these masters of illustration as a way to learn some of their chops. Quentin's original is shown below. I focused on keeping the ink lines and watercolor as loose as his was (my printout of his original came out much pinker than what you see in this image).